Ivysaur in game: 383 Who? Important notice! Pokemon Ivysaur is a fictional character of humans. Ivysaur (Japanese: ????? 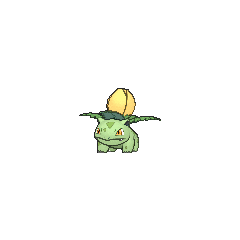 Fushigisou) is a dual-type Grass/Poison Pokémon introduced in Generation I.
Ivysaur is a quadruped Pokémon similar to a dinosaur. It has blue-green skin with darker patches. On top of its head are pointed ears with black inside, and it has narrow red eyes. It has a short, rounded snout with a wide mouth. Two pointed teeth protrude from its upper jaw. Each of its feet have three claws on them. The bulb on its back has bloomed into a large pink bud. A short brown trunk surrounded by leafy green fronds supports the bud. 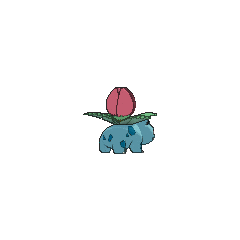 The weight of the plant prevents Ivysaur from standing on its hind legs and forces its legs to grow sturdy. When its flower is ready to bloom, it gives off a distinct, strong sweet-smelling aroma and starts swelling. Ivysaur will also start spending more time in sunlight in preparation for its upcoming evolution. 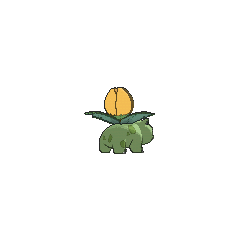 Exposure to sunlight adds to the strength of both Ivysaur and its plant. Ivysaur's natural habitat is plains. However, it is rare, as many are in captivity. 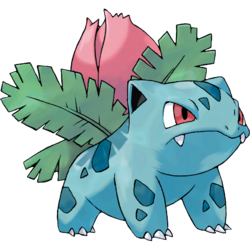 May's Bulbasaur evolved into an Ivysaur sometime after The Right Place and the Right Mime, which further evolved into a Venusaur prior to Pruning a Passel of Pals!. In Bulbasaur's Mysterious Garden, numerous Bulbasaur were seen evolving into Ivysaur, during which Ash's Bulbasaur decided it was too early to evolve. A Trainer named Assunta used an Ivysaur to battle and defeat Ritchie in the Indigo Plateau Conference in Friends to the End. An Ivysaur was under the ownership of Crystal in Putting the Air Back in Aerodactyl!. Ivysaur appeared under the ownership of a teenager named Jimmy in Judgment Day. Ivysaur first appeared in A Chansey Operation, where it was one of the injured Pokémon brought to the clinic. In The Ultimate Test, an Ivysaur was one of the Pokémon owned by the Pokémon League entrance exam instructor. Ivysaur was among the numerous Pokémon who moved closer to the sea as it sensed the disturbance caused by Lawrence III in the second movie, The Power of One. Multiple Ivysaur appeared in the intro of Destiny Deoxys. A Coordinator's Ivysaur appeared in Playing the Performance Encore! participating in the Battle Stage of the Daybreak Contest along with a Togetic. Ivysaur appeared in SM003, a silhouette. In Pokémon Adventures, Red had an Ivysaur named Saur that evolved from his Bulbasaur upon his arrival at Celadon City in Wartortle Wars. It evolved into Venusaur during a battle with the legendary bird hybrid at Silph Co. in The Winged Legends. Emerald rented an Ivysaur during his Battle Factory challenge. 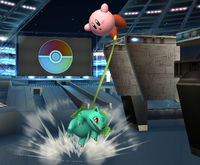 In Super Smash Bros. Brawl, Ivysaur is the only Pokémon that Pokémon Trainer uses that does not use an HM move. Squirtle uses Waterfall, while Charizard uses Rock Smash and Fly. Due to the censor that prevents Pokémon with offensive nicknames being traded on the GTS, an Ivysaur with an English name cannot be traded on the GTS without a nickname in Pokémon Black and White. Ivysaur appears to be based primarily on some form of reptile, specifically mammal-like reptiles known as Dicynodonts from the Permian period. Along with visible ears and no genuine metamorphosis stage (evolution aside), Ivysaur appears to have more in common with mammals than amphibians such as frogs and toads, which metamorphose from one definite creature into another as they mature as opposed to just growing into a larger adult version of itself the way that Bulbasaur does. Alternatively, Ivysaur's large rounded snout, wide mouth, wide-set eyes, blotch-patterned skin, and quadruped-like movements are vaguely similar to those of certain amphibians, such as the common toad. 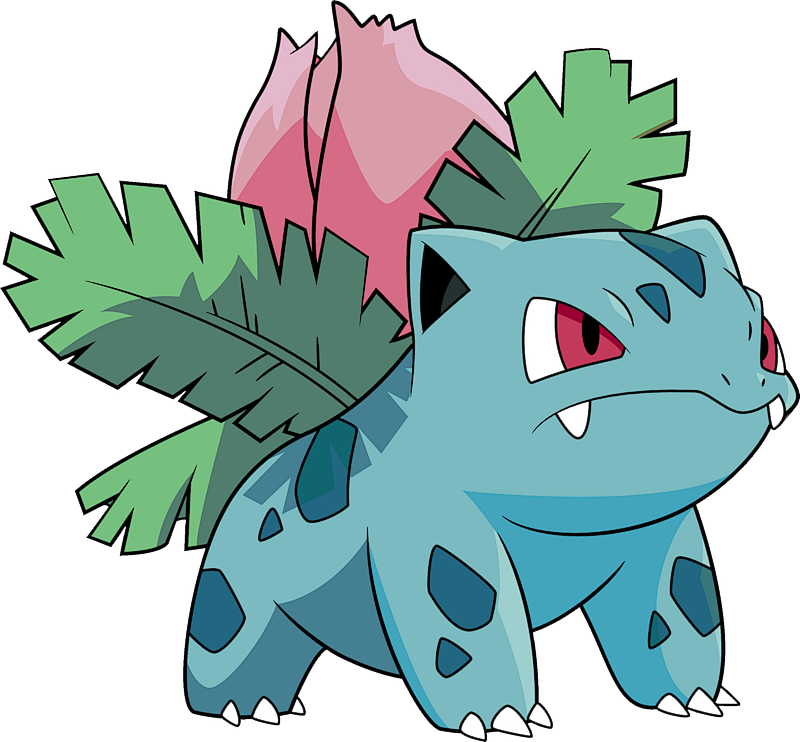 Unlike Bulbasaur, Ivysaur's "ears" do have hollows indicating that they are in fact ears and not glands, as seen in many species of frogs and toads. The bulb on its back now resembles the bud of a genus of parasitic flowering plants known as Rafflesia. Ivysaur is a combination of the words ivy (woody climbing or trailing plant genus) and the Greek saur (lizard). Fushigisou can be taken to mean "it seems strange" or ??? ? fushigi sou (strange grass). Cantonese Chinese ??? Geiyihchóu Literally "Unusual grass"
Mandarin Chinese ??? Mìaowacao Literally "Wonderful frog grass"